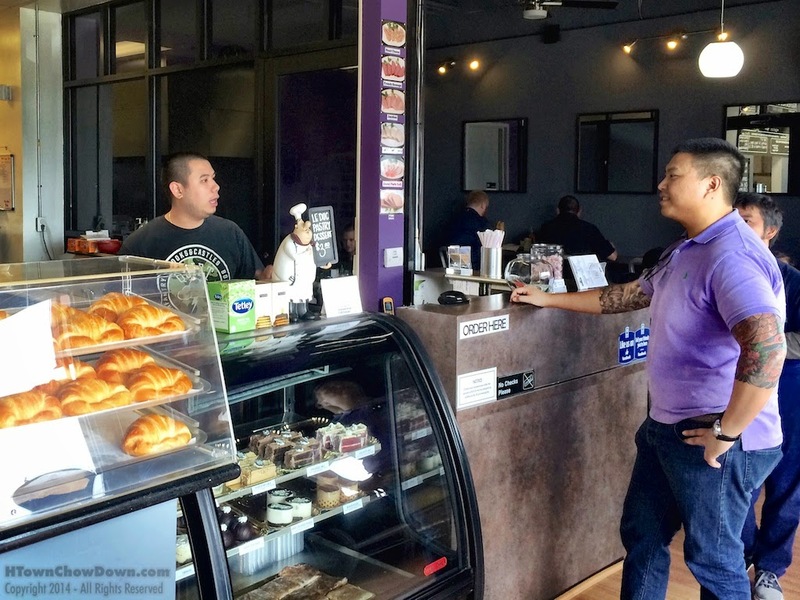 The restaurant scene in the Woodlands is growing and thriving. 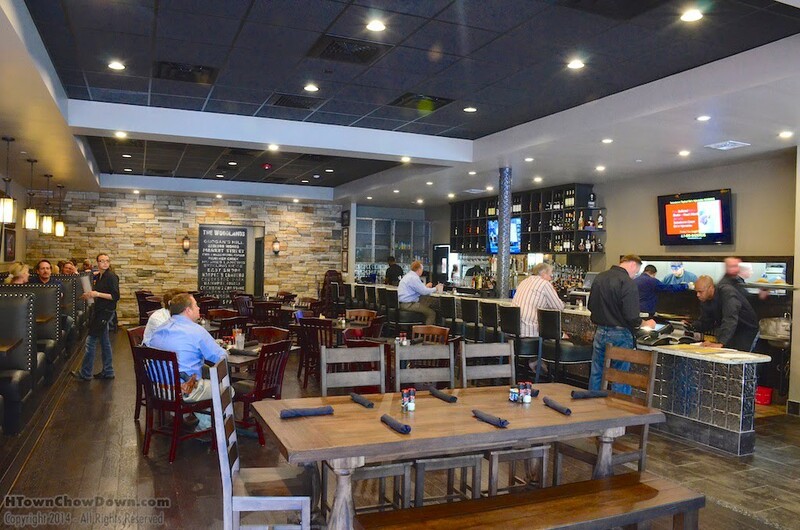 New places open each month, but none have intrigued us as much as the Republic Grille, a new concept debuting in the Panther Creek Village Center in the Woodlands. Republic Grill replaced one of the Woodlands’ oldest restaurants, Ace Chinese, a restaurant that had lasted well beyond its sell-by date due to the fact that it was one of the only Chinese delivery spots serving the central Woodlands. We’d heard rumors about Republic Grill, and were excited to hear (via our Woodlands Area Foodies Facebook group) that Monday was opening day. So we changed our lunch plans and headed over to investigate. We weren’t prepared for the full experience of walking in the doors. The dank, dated Ace Chinese interior was nowhere to be seen. The new space was stunning. We were immediately impressed by the total makeover of the location, which had apparently been gutted down to the studs. The interior has an upscale, rustic vibe that’s immediately at home in the community. Lots of stone, wood, dark iron, and photograph from around the community locate the restaurant firmly in the Woodlands. This isn’t a chain that’s just moved in from Los Angeles. 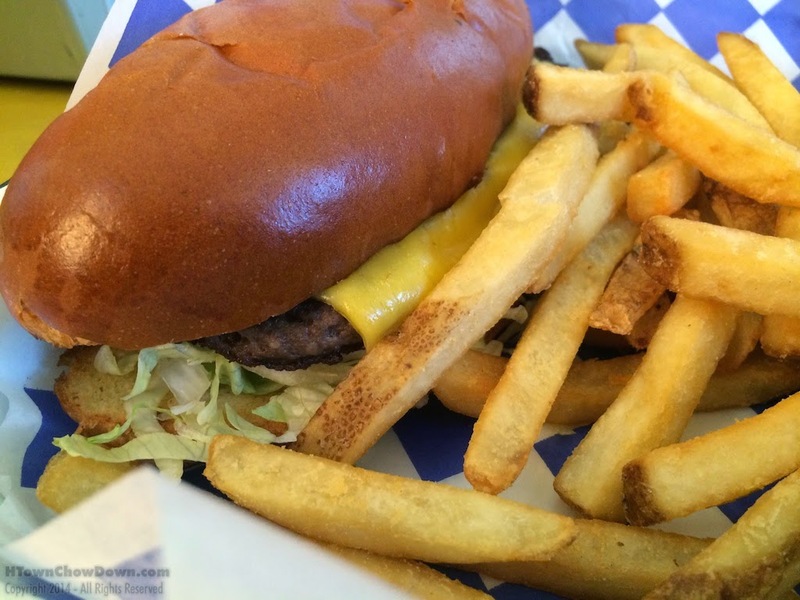 It was time for lunch, and after scanning the lunch menu, we were, not surprisingly, drawn to the Republic Burger. Our server took our order, and the burger appeared after a short delay. The nicely charred, hand-formed patty of certified Angus beef had the flavor of open-flame grilling which accented its rich, beefy undertone. As requested, it was cooked medium rare. 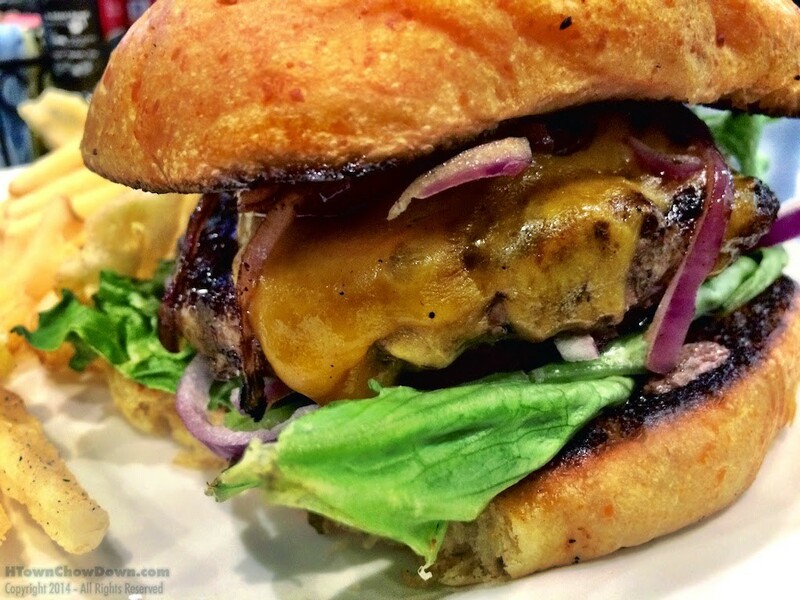 A generous slice of cheddar cheese had been melted atop the burger, and it was stacked with crisply fresh purple onion slices and lettuce at our request. We chose the jalapeño cheese bun from the proffered options, and it added a gentle whisper of heat to this well designed classic burger. Waffle fries that accompanied it were seasoned well with salt and pepper; we applaud a restaurant whose kitchen isn’t afraid to season its food. We were so taken by lunch that when our evening ran late and it was time for dinner, we gathered up friends and family and headed back for round two. The restaurant is perhaps even more inviting by night, with the rich surfaces and dramatic lighting creating a very cozy space. 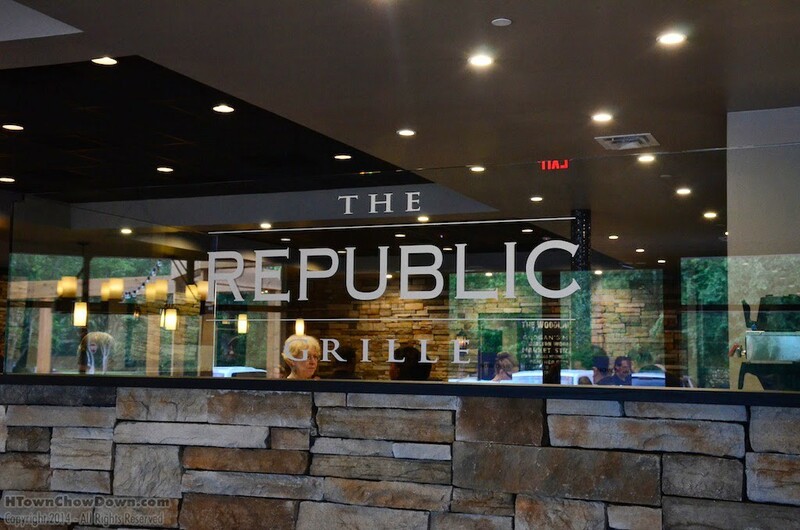 We could easily imagine the Republic Grille being the backdrop for an intimate date night. Being the Woodlands, there were plenty of families in attendance; apparently word had gotten out that they’d opened. Our large group ordered a variety of items. My son quickly zeroed in on the chicken-fried steak, the entree I’d planned to order. Fortunately, I was able to snare a bite before the budding power lifter devoured his dinner. The steak is a slab of certified Angus beef, very tender and lacking the gristle that is often found in this dish. The crust was light, crispy and flavorful. Finishing off the entree was house made cream gravy, subtly peppery, rich, and delicious. 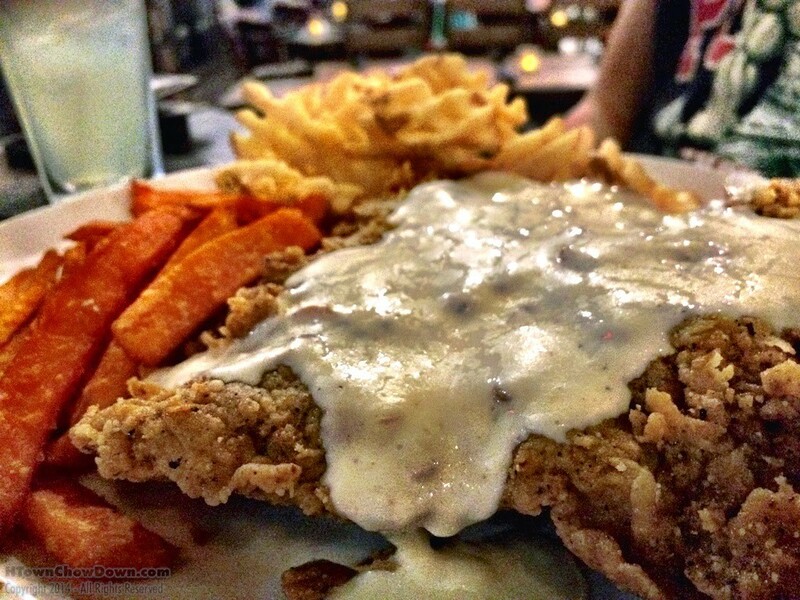 Without a doubt this is the best classic chicken-fried steak that I’ve found in the Woodlands area. My bride ordered the lighter Texafornia sandwich, a grilled chicken breast topped with avocado, tomatoes, red onions, and a tangy chipotle mayo. 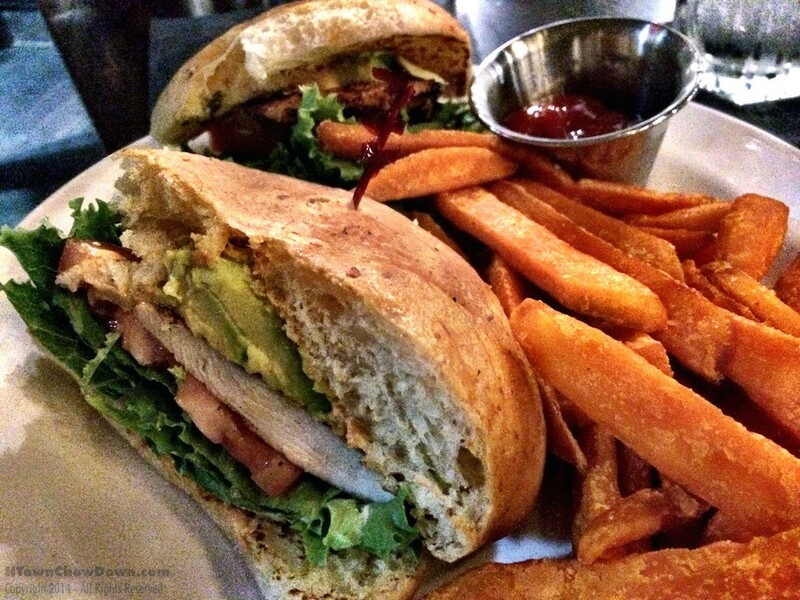 Presented on the jalapeño cheese bun we tried at lunch, this lighter sandwich featured nicely grilled chicken, and the flavor accents of the chipotle and tomato melded well with the lush, creamy avocado. Since my son had spoken for the chicken-fried steak, I perused the well edited menu for a different entree to try. 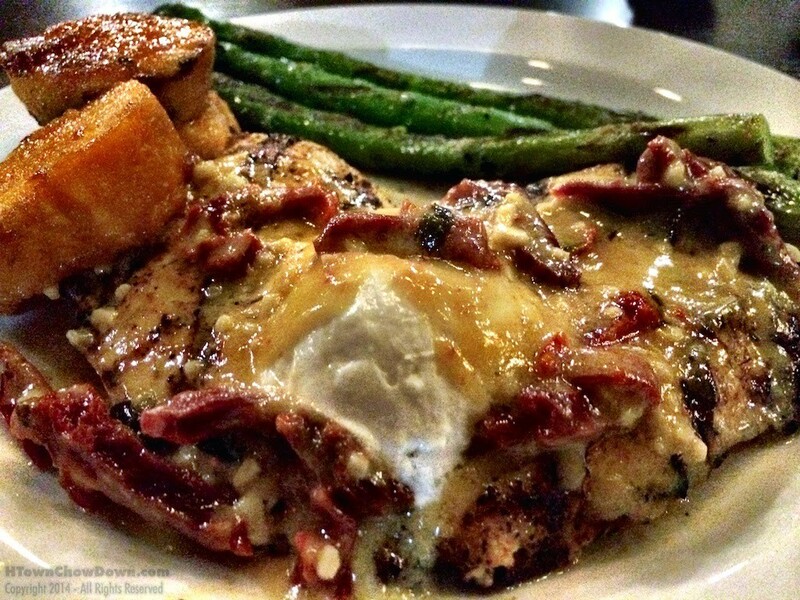 My attention was drawn to the Chicken Woodlands entree, a grilled chicken breast smothered with goat cheese, sundried tomatoes, and finished with a lemon basil sauce. This unique combination of flavors was an unqualified success. The smoky grilled chicken and the lush, creamy goat cheese were balanced by the tangy counterpoint of the lemon basil and the sundried tomatoes. Chicken dishes are often an afterthought on restaurant menus, but this one deserved its spot at the top of the entree list. The sides were tasty as well; we sampled the light, airy sweet potato cakes, and the beautiful large stems of grilled asparagus. We’ve learned not to set our expectations too high on a restaurant’s opening day, but the pros behind Republic Grill opened with guns a blazin’. 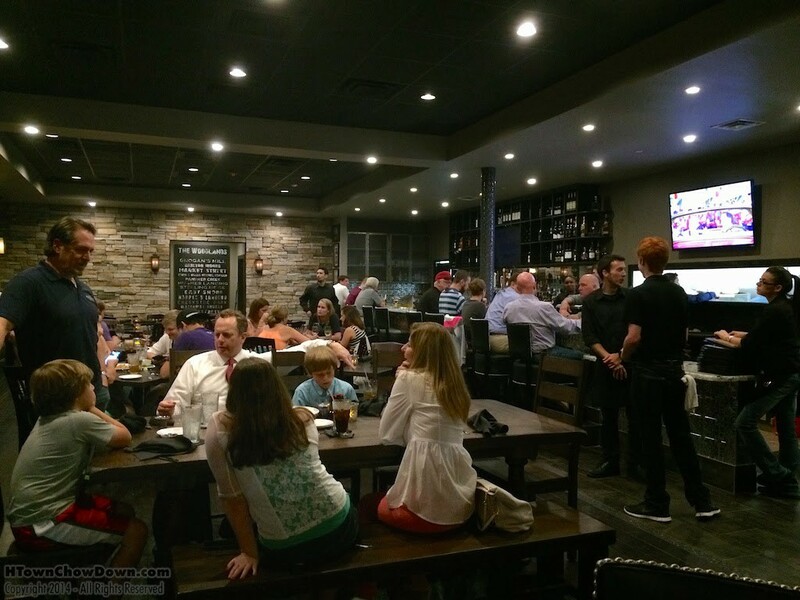 Everyone we spoke with, from the partners (who bring experience from Tailgator’s and Stadia Grill) to the managers, to the well-trained servers were smiling, confident, and had obviously worked hard to open this brand new concept with such polish and verve. We spotted some familiar faces from around the Woodlands, including Hali Hensley, our favorite server from Fielding’s Wood Grill, who was now putting her culinary expertise to work in Republic Grille’s kitchen, and Kimberly Lewis, who was working the floor in her role as manager, making sure the lunch service ran smoothly. We can confidently recommend this restaurant to anyone looking for hearty, well-prepared Texas cuisine served in an upscale atmosphere that’s perfect for family and friends. It’s a great addition to the neighborhood and to the Woodlands. We’re looking forward to visiting again soon. Can't wait to try it out. Great review. Would be nice to see the prices in these reviews. After reading your review, we went last night. It was fantastic! Thank you for finding all these great restaurants for us. The Good Stuff: Food was great! From the unique appetizers to the main courses, all were very good; the 'feel' of the place was excellent – rustic, wood, stone combo was nice. The Bad Stuff: 2 1/2hrs for dinner – due to long delays in the kitchen; wait staff was below average; NO ONE SMILED, not even hostess; the owner & managers needs to walk around and ask are things are going; if they are to be sucessful, they need to make the customer comfortable……the competition is too high for average service. I agree with the service issue. Our appetizer came out with the meal. The food was very slow to arrive. The food was good but certainly not of rave review status.